There are many good places to eat in Healdsburg, and it was difficult to make up my mind about where to go. I considered Cyrus and the Dry Creek Cafe, before deciding I didn't want to spend that much money, and went back and forth between Zin and Ravenous quite a few times. Finally, the overwhelmingly positive reviews of Ravenous won me over and I made a reservation there for a Friday night in July 2008. It was the right call to make, as our dinner there was great. Ravenous features a small, cute dining room, and a much larger patio and deck outside. I made a reservation for a table outside, which was a great decision as it was a very warm night. We ate on the deck, but I think a table in the garden would have been nicer - it's more festive down there. Bear in mind that many of the tables are very close together; we couldn't help but become dining companions with the people sitting next to us. The other annoying, though probably unavoidable, part of the experience were the flies flying around our legs. They left our food alone, however. Ravenous offers your typical wine country cuisine, which I'm not sure how it differs from California cuisine in general (perhaps there is a more liberal use of wine?). I wasn't tempted by any of the appetizers, but Mike ordered the crab cakes for himself (I don't eat crab - I think they were around $11). He really liked them. 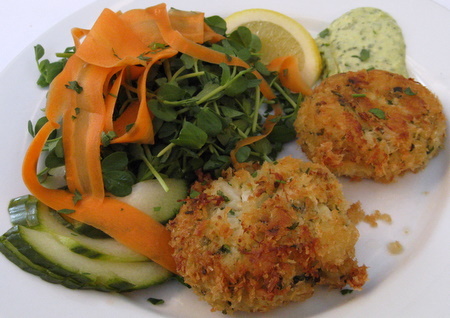 They had a lot of good quality crabmeat, and very little filler. They didn't stay together well, but he didn't think that was a problem. The crab was well seasoned, with the seasonings not overwhelming the flavor of the crab. They were good by themselves or with the delicately herbed sauce with which they were served. They came accompanied by generic greens and what seemed to be slivers of pickled carrots, that Mike found to be very, very good. He was glad he ordered this dish. My main dish was a grilled flat iron steak in a shallot, port, red wine sauce, served with mushrooms and roast potatoes ($26). 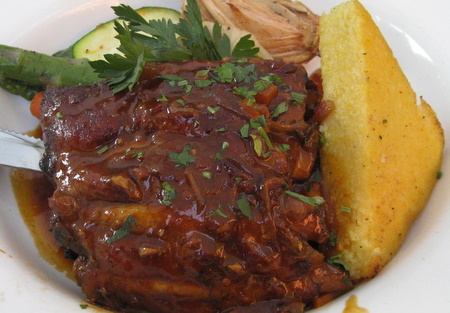 Mike ordered the BBQ baby back ribs with fennel and polenta ($24). My steak was very tender and flavorful. The sauce was well balanced, though it had a little bit too much black pepper in parts. Still, I thought it was very good - especially with the mushrooms or the potatoes (which were just a tad undercooked for my taste). Indeed, I wish there had been more sauce. I really liked the dish, but the portion was a tad too small, if you hadn't had an appetizer. This is clearly a place where you'd want to order a three course dinner. Mike was also happy with his ribs. The semi-sweet sauce was not exceptional, but had a bit of spice. The ribs were tender, though they still had a bit of pull and they were not overdone. The accompanying polenta, however, was completely tasteless. It had no seasoning at all, and was badly matched with the ribs. We couldn't figure out what the chef was thinking. 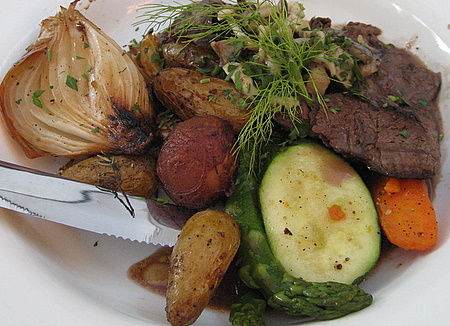 Both dishes were served with similar accouterments: grilled asparagus, zucchini, carrots and an onion. Mike's fennel was nowhere to be found. IMHO, when restaurants charge more than $20 a dish, they should match the sides to the specific main entree, rather than use the same things for every entree. But perhaps (I hope) the kitchen was super busy because it was a 4th of July. The kitchen also had some problems with dessert. 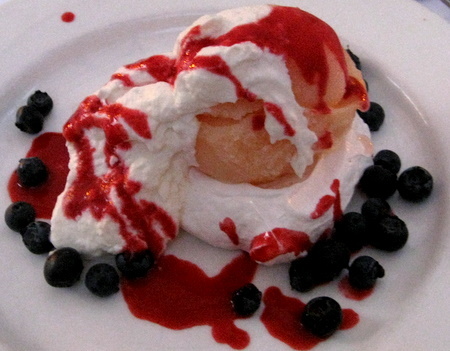 Mike ordered the Pavlova with cantaloupe sorbet, whipped cream and strawberries. He got blueberries instead and a raspberry coulis. Apparently, the pastry chef gets her berries confused. Mike liked the dessert, but the meringue was overwhelmed by the whipped cream and blueberries - he opted to eat it by itself. The meringue was sweet and chewy, but not amazing. The cantaloupe sorbet, on the other hand, was delicious - Mike said it tasted like cantaloupe, but not overwhelmingly so. I tasted it, and what he meant was that the sorbet had a light cantaloupe flavor. The whipped cream, also present on my dish, was very light but didn't have a strong cream flavor - not a favorite. 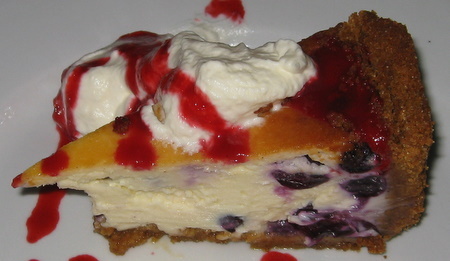 I had the Blueberry Mascarpone cheesecake, served with whipped cream and berry sauce (the same raspberry coulis Mike had). The cheesecake was delicious. It was unbelievably smooth, light and creamy and had an intense flavor. The unsweetened blueberries provided both a needed note of acidity and some texture. The shell was sweet and fresh tasting. In all, it was a great dessert. Perhaps the one sour note of the evening was the service. It was friendly and competent, but we didn't get those little "extras" (perhaps because they were so busy). We were served bread and butter soon after we came in (3 pieces, both the bread and butter were very good), but they never offered us more when we finished it. Only one of us ordered an appetizer, and they neither offered or brought another plate for us to share (not that we would have, anyway, but they didn't know that). Service was also slow at times. In any case, these considerations were minor. We didn't order wine, but Ravenous offers a nice wine list of reasonably priced local wines, several by the glass. Nothing we had tasted, however. In all, we had a lovely evening and I'd go back to Ravenous again.